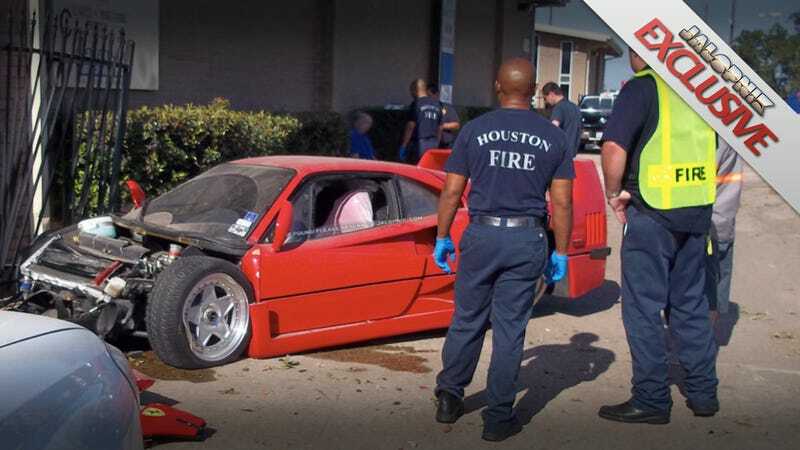 Last week's crash of a half-million-dollar Ferrari F40 in Houston was more than just an unfortunate accident, it was, according to exclusive details Jalopnik gathered over the weekend, the result of a mechanic's test drive gone horribly wrong. The photo shows the aftermath: a rare and expensive Ferrari F40 worth at least $500,000 crushed by a fence. The wheels bent, the front-end destroyed, and a man in the background being treated by EMTs. What the photo doesn't show is how the car wound up in its condition. We've learned from numerous sources that the Ferrari F40 wasn't being driven by the car's owner, but by a mechanic responsible for the vehicle. In fact, the owner was in Europe on business and didn't even know the vehicle was wrecked until this weekend. Eyewitnesses report the car was traveling down Hempstead Road and turned onto 34th Street in Northwest Houston traveling at a speed above 60 MPH, despite a posted speed of 35 MPH along the busy thoroughfare. Some say he was going between 70-to-90 MPH. "I don't know how fast he was going, but he had to be going 60+ because I could hear the turbos spooling on the car," said Travis Brown, an employee at a nearby store who witnessed the crash. "Next I know I heard tire squealing, then he jumped the curb and hit the fence." Whether the crash occurred because of a driver error or a mechanical failure is unclear, but the distance of the crash from where the F40's driver lost control shows he was definitely traveling at a great deal of speed. "He had to go airborne," said Brown. Though slightly injured, the driver was alert and standing when EMTs arrived to treat him. The owner, who purchased the car new and has been driving it ever since, was shocked when he heard about the vehicle. Because the F40s frame is damaged the car is being treated as a total loss. "It's just a real screwy deal," said a source familiar with the accident. We're not releasing the name of the owner, but we can tell you he's not one of Houston's famous Ferrari F40 owners — a list that includes Jim "Mattress Mack" McIngvale and former heavyweight champion George Foreman. I repeat: George Foreman's grille is still intact.